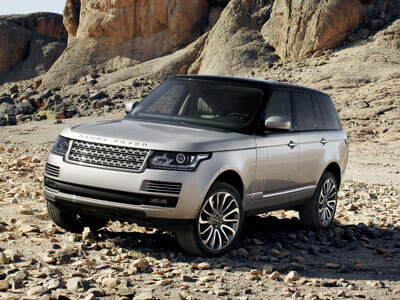 The Range Rover comes powered by one of two direct-injection engines. HSE and HSE Lux models utilize a 375-horsepower, 5.0L V8, while the SC models get a510-horsepower, 5.0L V8. Both engines are shared withJaguar but tweaked for the Land Rover and are mated to a 8-speed automatic transmission and 4-wheel-drive system. Both engines feature variable camshaft timing that enhances performance, optimizes emissions and provides respectable fuel consumption. The HSE can get to 60 mph in just 7.2 seconds, while the SC can make the same dash in 5.9 seconds. The heart of the Aventador--as is the case with every Lamborghini--is its engine. The car is powered by a mid-mounted 6.5L V12. The engine features variable valve timing and a dry sump lubrication system, which allows it to sit lower in the car for an improved center of gravity. The big V12 produces 700 hp at 8,250 rpm and 507 ft-lb of torque at 5,500 rpm. All that power is put to the road through a smart all-wheel-drive system and a 7-speed sequential manual transmission that offers near-instantaneous shifts. The Aventador rides on alloy wheels (19 inches front, 20 inches rear) and Pirelli PZero tires, with large carbon ceramic disc brakes providing stopping power. Suspension is and advanced system fitted inboard via pushrod monotube dampers, much like the setup found on open-wheel race cars. The cockpit is an exercise in race-car-for-the-street ergonomics. All instrumentation is displayed on an LCD screen, with a separate LCD for the navigation and stereo system. Interior surfaces are leather and available in nearly any color combination, thanks to Lamborghini's Ad Personam customer individualization program. Driver-controlled electronic stability control and anti-lock brakes are standard, as is a cabin full of intelligent airbags. The LX 570 is built on a sturdy truck platform that is shared with the Toyota Land Cruiser. It's powered by a 383-hp, 5.7-liter V8, hooked up to a 6-speed automatic transmission. The engine utilizes Dual Variable Valve Timing for smooth responsiveness through a wide rev range, and Lexus says that it produces its peak torque of 403-pound-feet at 3,600 rpm and 90 percent of that at just 2,200 rpm--which makes it well-suited to towing. Properly outfitted, the LX 570's tow rating is an impressive 7,000 pounds. The transmission includes provisions for heavy towing or off-road use and has a sequential mode for manual control. The LX 570 also comes with full-time 4-wheel drive utilizing a Torsen limited-slip locking center differential that sends 40 percent of power to the front wheels during normal driving, directing more to the front or back as needed for better grip. An active traction control system helps avert wheelspin and send power to the wheels that can use it, while the stability control aids control both on- and off-road. For more serious conditions, there's also a low range and locking differential mode.In addition to this combination of mechanical hardware and electronic aids, there are several other electronic assistants that help with difficult situations. Crawl Control helps keep momentum on tough surfaces, such as loose boulders or sand, and Hill Start Control helps start from a stop on a steep, slippery slope.Inside, the LX 570 offers three rows of seating, with big bucket seats in front with extendable lower cushions. The second row is also very spacious, with a nice high seating position and plenty of headroom. Third-row seats are better suited for kids, and they retract electrically when not needed, to a flat cargo floor.For a vehicle with such capability built in, the LX 570 handles quite well on the road--and has a relatively smooth ride and quiet interior that's worthy of the Lexus badge. Its body-on-frame construction allows isolation from jolts, while the long-travel double-wishbone front suspension and multi-link rear setup with air springs and a solid axle allows ruggedness combined with good control. An Active Height control system lowers the vehicle two inches for entry and exit or lowers it partway at highway speeds, while the Adaptive Variable Suspension system includes three modes, with a Comfort mode for very bumpy trails, a Normal mode or Sport mode for curvy roads. The LX 570 includes a total of ten airbags, including seat-mounted side airbags in the first and second rows, plus side-curtain bags for all three rows and knee bags for front occupants. Large anti-lock brakes with Brake Assist are also included.Just as any other Lexus model, the LX 570 comes with a long list of features, including many traditional luxury items and high-tech conveniences. A power rear door, push-button start, Smart Access entry, 4-zone climate control, a rear backup camera, a windshield de-icer, a navigation system, and a 9-speaker sound system with iPod and USB connectivity are all on the standard-features list. The navigation system now includes Safety Connect concierge and roadside assistance services, along with Lexus Enform information, which displays weather, traffic and stock market data.Options include a Luxury Package that brings a cooler box, semi-aniline leather upholstery, African Bubinga wood trim, a heated steering wheel, heated and cooled front seats and heated second-row seats. The Nissan GT-R is offered in Premium and Black Edition models, both powered by a special 3.8L twin-turbocharged V6, now making 530 horsepower and 448 pound-feet of torque. Power is put to all four wheels with a performance-oriented all-wheel drive system, and a six-speed dual-clutch gearbox (with no actual clutch pedal) handles the shifting.With the new GT-R's additional power, the dash to 60 mph takes around three seconds, and top speed is expected to be up from last year's 193 mph. Brakes are strong enough for secure stops from well into triple-digit speeds, and handling is enhanced by the variable-power-split AWD system. The ride is stiff, in a nod to this car's prioritization of performance above all else. Inside, the GT-R feels snug, with a strong cockpit design. The driver sits low in rather narrow, very well bolstered sport seats, with a wide center console alongside. 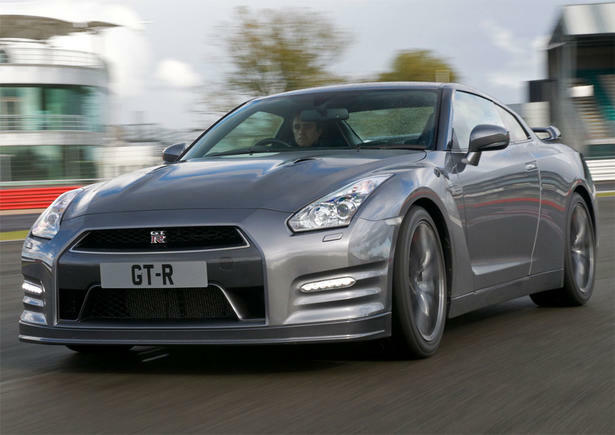 Steering-wheel paddle-shifters can command quick shifts, while center-stack controls are canted slightly toward the driver.The GT-R has a very extensive list of features. Heated, leather-suede-trimmed seats, full power accessories, an Intelligent Key entry and ignition system, a navigation system with XM NavTraffic and NavWeather, a universal garage-door opener, and Bluetooth hands-free phone connectivity are all included. So it a Bose sound system with nine speakers, two subwoofers, Bluetooth streaming audio and DVD playback capability, USB and iPod connectivity, and XM satellite radio.Priced about $6,000 above the GT-R Premium, the Black Edition adds metallic black lightweight forged aluminum wheels, designed by RAYS, plus Recaro sport bucket seats plus unique red and black interior trim. 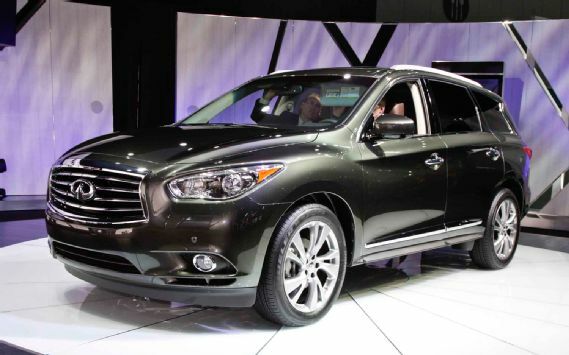 New this year, the 2013 Infiniti JX35 finally gives Nissan's luxury arm an entry into the high-zoot three-row-crossover segment dominated by the Acura MDX and, to a lesser extent, the Audi Q7. The company is counting on the JX to become its best seller behind the perennial G sedan. Infiniti Americas vice president Ben Poore says the company is putting marketing dollars behind it, making the JX its most promoted vehicle ever. More than just advertising, Infiniti is using the JX launch to pull out all the stops in its attempt to become a top-tier luxury brand. To that end, the JX (along with the rest of the brand's lineup) gets the Infiniti Personal Assistant concierge service standard for four years. The tagline promises Anything, anytime, anywhere, though a quick call to the service confirmed that the line is drawn at hookers and blow.Subtle luxury touches come through on the outside, and the JX looks smaller than its interior dimensions suggest. Designers used the brand's double-arch grille and wave-design hood, but relatively modest headlights and taillights combine with a rear-sloping roofline to visually shrink the big crossover. Add in the unique crescent-fresh D-pillar and big wheels, and the overall look is attractive for a three-row ute. In a nutshell, the JX35 drives like a big crossover. Nissan/Infiniti's VQ V6 is always a welcome engine to have under the hood, and with 265 hp and 248 lb-ft of torque in this application, it moves the JX around without drama.Generally unwelcome is a continuously variable transmission, which the JX also has, though this unit is actually satisfying in about 80 percent of driving situations. Only when the driver mats the pedal for passing or hard acceleration does the CVT go into that slipping-clutch-at-redline mode we so detest. Brake feel is excellent as is handling, considering what the JX is. The overall experience is confidently forgettableexactly what most luxury crossover buyers are seeking. 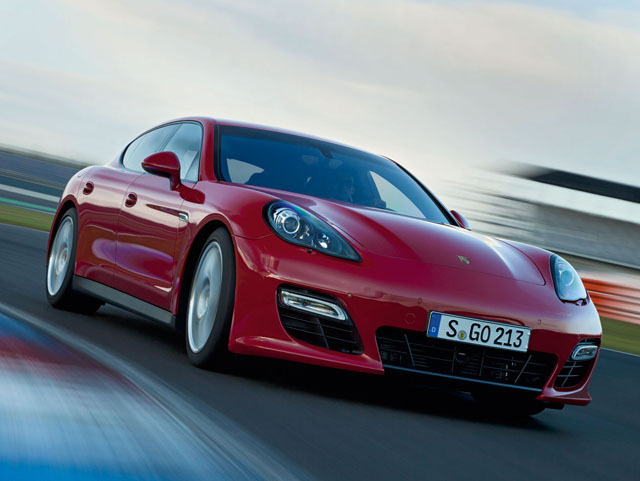 Porsche brings forth the 2013 Panamera GTS. Basically a sportier version of the current Panamera 4S, the $110,875 GTS will be the third most expensive derivative of Porsches sedan, after the $137,675 Turbo and $174,175 Turbo S.
Introduced at the Los Angeles auto show, the naturally aspirated GTS pulls its suspension and brake components from the Turboincluding the blown cars larger front rotorswhile its free-breathing 4.8-liter V-8 gets a revised intake and stouter valve springs. Redline is up 400 rpm, to 7100, and peak horsepower climbs 30, to 430. The engines noises are enhanced using a Sound Symposer similar to that on the new 911, with an acoustic tube and vibrating membrane that transmits intake snarl to the cabin via the A-pillar. Down low, the air suspension that is optional on base Panameras is included on the GTS, with firmer shock rates and a ride height that is dropped 0.4 inch. Both the standard 19-inch wheels and the optional 20s wear Michelin Pilot Sport summer rubber, and the rear wheels get 0.2-inch spacers to widen the track slightly. Visually, the changes include a front bumper from the SportDesign package available on other Panameras (one of the 10 million options on all Porsches) and the deployable three-element, four-position rear spoiler from the Turbo. Theres also some extra black body trim, and a new arrest-me-now red called Carmine joins the palette. In a first for the Panamera, Porsche says itll paint the car any bespoke color you can think of. Leather and Alcantara, the artificial mouse fur that is the universal code for sporty, are used throughout the interior. Sill plaques identify the model as a GTS, as does lettering embroidered on the seats. The Sport Chrono package is standard and adds a Sport Plus setting for suspension and powertrain settings, as well as a 5500-rpm clutch-drop launch-control function on the PDK seven-speed auto-manual transmission. Youll want to try that after the crossing guard leaves the intersection. Several engine updates were made for 2013, including a revised 3.0L inline 6-cylinder turbocharged engine in the xDrive35i that makes 300 horsepower. xDrive50i versions are fitted with a retuned all-aluminum twin-turbo 4.4L V8 with variable valve timing and direct injection. It features what BMW calls a "reverse flow" setup, with its twin turbochargers situated within the valley between the cylinders. It makes 400 horsepower and 450 lb-ft of torque. At the very top of the range is the intense X5 M, featuring 555 horsepower from a tuned version of the xDrive50i's 4.4L V8.Both the xDrive35i and the xDrive50i use an 8-speed automatic transmission, first introduced in the 5-series Grand Turismo. Brake energy regeneration is also used on both gasoline engines, which uncouples the alternator from the accessory drive system, allowing the battery to only be charged during coasting or braking. This, BMW says, results in up to 2 percent fuel economy boost. The X5 M features a 6-speed automatic as the only transmission option.Standard safety features include a myriad of airbags--driver's and passenger's front and side units as well as head airbags for the first- and second-row seats. In addition, BMW offers Dynamic Stability Control, Dynamic Traction Control, Dynamic Brake Control, Hill Descent Control and Dynamic Cruise Control. Active Cruise Control and Lane Departure Warning systems are also available. There's also a rearview camera that can provide a 360-degree exterior view, a Heads-Up Display that projects onto the windshield in the driver's field of view and a Park Distance Control system that alerts the driver of obstacles behind the vehicle while parking. This medley is typical of what set apart from other vehicles X6 both in-class and BMW in particular. All the indications that the model 2013 will try to lean in the direction of a little less by improving the body to emphasize the clean edges and higher performance.Nice interior comfort in the 2013 BMW X6, meanwhile, may not be retooled. Very few reviews have enhanced natural objection to leather seating, extensive control panel audio, power doors, mirrors, and other accessories that make driving into a smooth and enjoyable experience. Weakness only for the interior is rather monotonous and bland panel, which can reduce the aesthetic experience ideal. The 2013 Toyota Land Cruiser is powered by a 5.7L V8 that makes 381 hp and 401 lb-feet of torque. The aluminum-block engine is similar to that used in the Tundra full-size pickup, and includes direct ignition, four valves per cylinder, variable valve timing and variable-length intakes-- it now runs on regular unleaded gas and meets ULEV-II emissions. The engine delivers power through a 6-speed automatic transmission with a flexible-lockup torque converter for smoothness. All Land Cruisers have full-time 4-wheel drive that includes a low range, limited-slip rear differential and a locking Torsen center differential. A body-on-frame layout assures more long-term durability for the Land Cruiser than unibody sport utility vehicles. In front, the suspension has a high-mount double-wishbone setup that is better for off-roading while not sacrificing on-road performance. In back there's a 4-link coil-spring arrangement with a stabilizer bar. To provide a good mix of off-road ability and crisp handling on-road, there's a Kinetic Dynamic Suspension System, which uses hydraulic cylinders to vary the suspension's stiffness as needed. The Land Cruiser's interior has three rows of seating, capable of holding up to eight. For ease of entry to the third row, the second row on the passenger side has a one-touch tumble feature, and the second row adjusts about four inches fore and aft. The Land Cruiser has ten air bags--the most in any Toyota vehicle--and all eight seating positions have 3-point seatbelts. Multi-terrain anti-lock brakes, with electronic brakeforce distribution and brake assist, are standard, along with the VSC stability control system. Hill-start assist control is also included and helps keep the vehicle stationary when starting from a stop on a steep incline or slippery surface, as is downhill assist control, a feature designed to regulate a target speed down steep slopes while off-roading. There is also the feature called Crawl Control. With the transfer case shifted to the low range, Crawl Control controls the throttle and brakes to maintain one of three speed settings ranging up to about 5 mph, allowing the driver to focus on steering around obstacles. Throughout, the new Land Cruiser has more sound insulation to yield a much quieter interior. The climate system has a micro-dust and pollen filter, with four zones and 28 air vents throughout the cabin. The standard-features list on the Land Cruiser is surprisingly luxurious, including amenities such as a power moonroof, heated power seats, rear privacy glass, Smart Key keyless entry and steering-wheel-mounted audio controls. The audio system is a JBL Synthesis that includes in-dash 6-disc CD/DVD changer, MP3/WMA playback capability, 13 speakers, a subwoofer, Bluetooth, satellite radio and iPod connectivity. Major options include a DVD rear entertainment system, a back-up camera, second-row heated seats and a touch screen navigation system that offers satellite-based traffic information. First introduced in 2003 to lukewarm applause, the Cayenne quickly silenced its critics by showing itself a serious performer. For 2012, the popular Porsche is redesigned in and out, and there's even more to like in 2012.Four models are offered: Base, S, Turbo and S Hybrid. Base Cayennes feature a 3.6L V6 putting out 300 hp. The S uses a 4.8L that churns out 400 hp. The Turbo version utilizes the same 4.8L V8 allowing it to produce 500 hp. Porsche claims 060 mph from the Turbo in just 4.4 seconds, with a top end of 172 mph. Finally, a new gas-electric hybrid-Porsche's first-employs a 333-hp supercharged 3.0L V6 and a 47-hp battery-powered electric motor that combine to deliver 380 hp. The Cayenne Hybrid can run on one or both of its powerplants for an even blend of power and fuel efficiency. Interiors have been redesigned for 2011 as well, with attention to detail in typical Porsche fashion and a look and feel that fall in line with what you see in the Panamera sedan. All rear seats are split folding. Cayennes are suspended by a double wishbone setup in the front and a multilink rear axle, with front and rear stabilizers. All Cayennes offer all-wheel drive. A 6-speed manual transmission is standard on the Base model, while a new 8-speed Tiptronic S automatic is standard on all others and available on the Base. Towing capacity maxes out at 5,952 pounds for the V6 and 7,716 pounds for all other models.The Cayenne comes with a lengthy standard equipment list. The Base offers power everything, heated mirrors, leather seating, 12-way electrically adjustable front seats with 4-way lumbar support, steering wheel audio controls, rain-sensing wipers, privacy glass, a premium stereo system, a power liftgate, universal garage door opener and auxiliary power outlets. S and Hybrid S models are equipped mostly the same, adding cruise control, a refrigerated glovebox and of course that V8 power. Turbo models include niceties such as aluminum interior trim and an Alcantara headliner, as well as Porsche Communications Management 3.0, which features a 6.5-inch color touchscreen display with integrated MP3, CD, DVD, and navigation. A 14-speaker Bose stereo is also standard in the Turbo. Lots of optional equipment can be specified on the Cayenne, including special exterior paint, special 19-inch wheels, larger fuel tank, Lane Change Assist, the Walnut or Anthracite Birch Interior Package, Porsche Active Suspension Management, Porsche Dynamic Light System, front and rear Park Assist, Porsche Ceramic Composite Brakes and more. Standard safety features across the range include 4-wheel anti-lock brakes with brake assist and brake readiness, advanced airbags throughout the cabin, traction control and stability control. 2012 BMW X5 35i Call 1-800-851-9000 or 1-888-861-8080 Low Prices Lease Payments ! Order Yours Today! The 2012 BMW X5 is a Sports Activity Vehicle with the sedan part and SUV part, the 2012 BMW X5 is expected to release in spring 2011. Changes to the 2012 BMW X5 more dramatically involving more than 4,000 new section just completed last year. These changes, commonly associated with the drive train, plus a turbo charging, kicking up the horsepower with new gasoline engines, and create a standard eight-speed automatic transmission. The 2012 BMW X5 has an impressive specification and feature as it combines excellent performance and comfort that will compete in the market with the Acura MDX, that, Mercedes-Benz M-Class, and Audi Q7 as the Luxury Midsize SUVs. The original BMW X5 was the first entry Barvarian Motor Works into the SUV market. Since then, JP Powers X5 has been rated among the best for lively performance and quality design. It also gets high marks for its interior design. In other areas, such as security, reliability, fuel economy, and resale value, usually ranked near the middle when compared with other middle-luxury SUV. 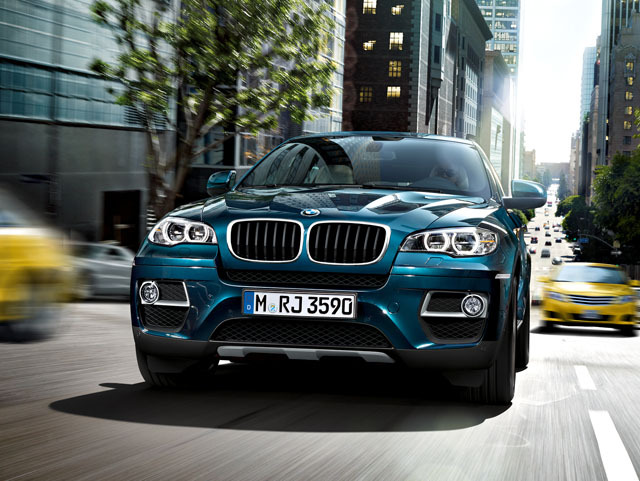 X5 has been a strong seller for the company, both in America and internationally. Since this has been moved to, the buyer can be ascertained transmission of 2012 BMW X5 has proved that he is capable of instant acceleration with no interruption of power. About a third of the new X5 is expected to be equipped with diesel xDrive35d. Body style will be similar to past models with long wheelbase and short overhangs provide a muscular appearance. The next big refresh for the new BMW 5 Series will probably not arrive before model year 2014.